In 1796, the U.S. half dollar was switched from the Flowing Hair to the Draped Bust theme. The small eagle reverse was carried for only two years, 1796 and 1797. Half dollar production was halted until 1801, when the Draped Bust was revived, but had a large eagle reverse. With a mintage of only 3,918 pieces, the Draped Bust Small Eagle Half Dollar has the fourth lowest mintage of all U.S. coin types. No more than 250 are believed to exist today. Accordingly, it rates near the top in value, regardless of condition. Whenever a genuine example is put up for sale, collectors with fat checkbooks are prepared to compete fiercely to secure one of numismatica’s greatest prizes. The 1796 comes in the 15 star and 16 star varieties. Both rate nearly the same in value. The 16th star was added to note Tennessee’s admission to the Union on June 1, 1796. The idea of adding a star for every new state was dropped when it became clear there would eventually be too many stars to fit on the nation’s coinage. Interestingly, all Draped Bust Small Eagle Half Dollars were minted in 1797. The demand was generated soley by the Bank of the United States, which deposited the silver and requested half dollars in return. The blue line above charts the percent increase since Year 2000 of the 1796 Draped Bust Half Dollar with 16 stars in G-4 condition. 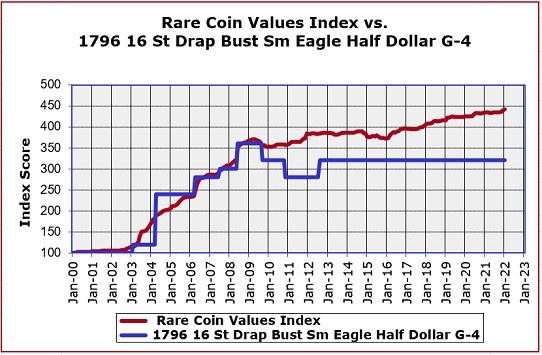 As you can see, the performance of the 1796 half dollar closely parallels the Rare Coin Values Index (red line) which tracks the combined percent change over the same time period of a pre-selected group of 87 rare US coins. The goal of the Index is to monitor the strength and direction of the overall rare US coin market. The Index is updated monthly.